Keeping the pan over medium heat, add the peppers, onions, salt, and pepper and cook until golden brown, about 5 minutes. Add the oregano, basil, and garlic and cook 2 more minutes. Add the wine, marinara, and chili flakes, if using. Stir to combine, scraping the bottom of the pan with a wooden spoon to release all the browned bits. Bring to a simmer. Cut the sausages into 4 to 6 pieces each, about 1-inch cubes. Add the sausage back to the pan and stir to combine. Cook until the sauce has thickened, about 20 minutes. Serve in bowls over pasta. Or, if serving as a sandwich, split the rolls in half lengthwise. Hollow out the bread from the bottom side of each roll, being careful not to puncture the crust. 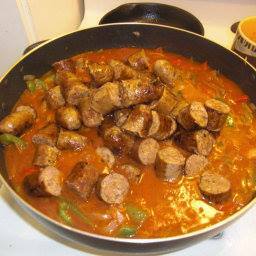 Fill the bottom half of the roll with sausage mixture. Top with mozzarella cheese and serve sandwiches immediately.